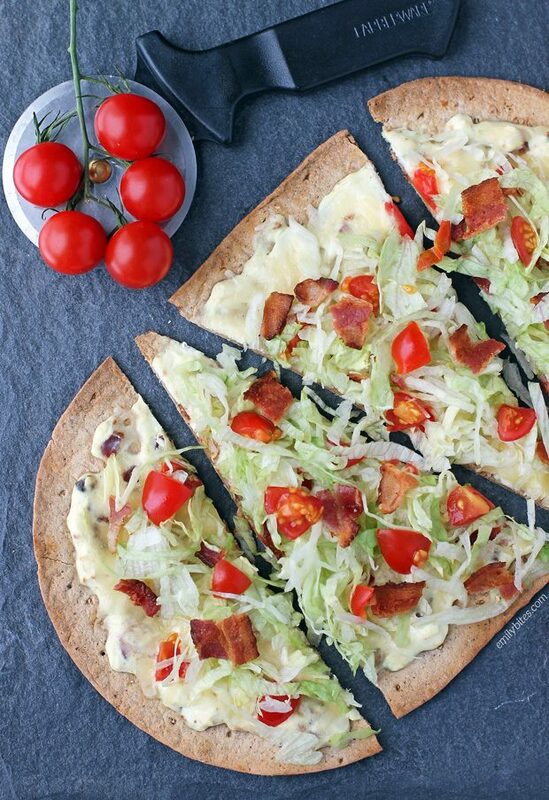 I have partnered with Flatout to create these BLT Flatbreads. I have been compensated for my time commitment to work with their product, however my opinions are entirely my own and I have not been paid to publish positive comments. 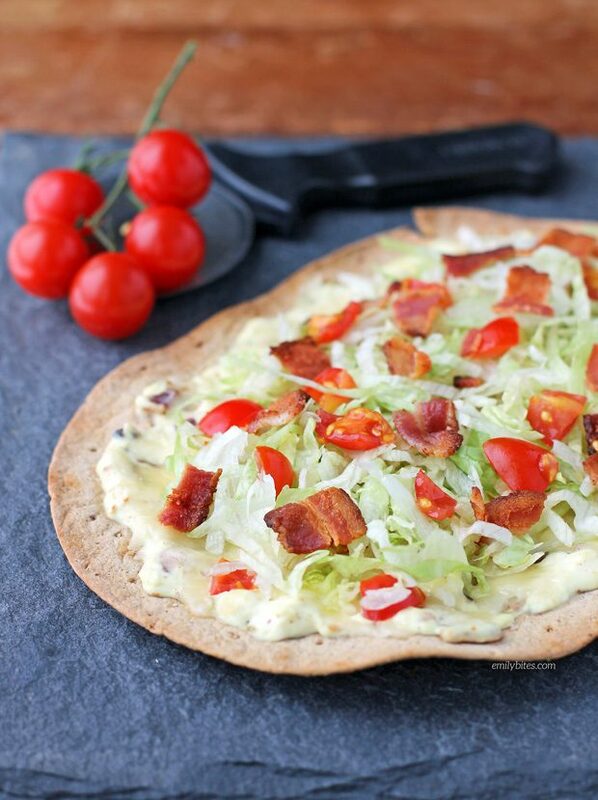 Y’all know by now that I love making creative flatbread pizzas, and I think you’re going to love these BLT Flatbreads. I took the concept from my BLT Dip and transformed it using my favorite Light Original Flatouts. With a crispy crust, warm cheesy layer, salty bacon, juicy tomatoes and crisp lettuce, what’s not to love? 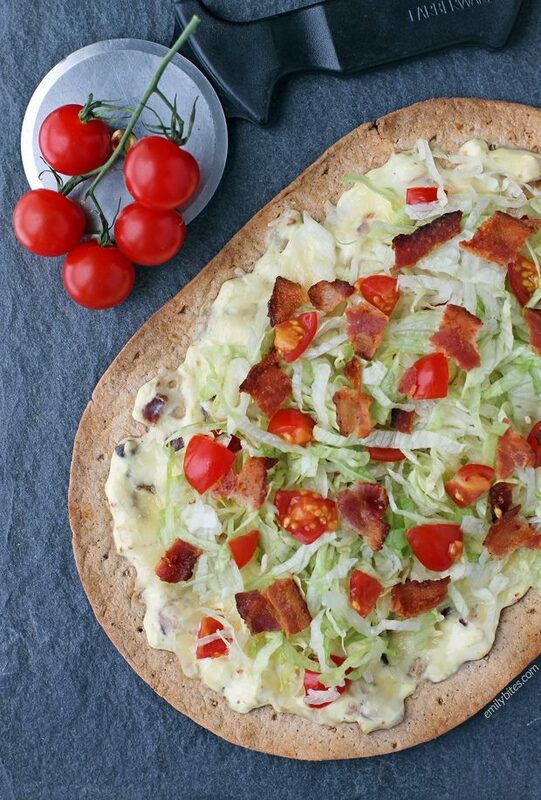 Plus each flatbread is only 313 calories or 9 Weight Watchers SmartPoints. Perfect for a quick and easy weeknight meal or weekend lunch! I always keep Flatout flatbreads on hand in my pantry because they are super versatile and make such quick, easy and tasty meals. It’s so easy to take whatever you can find in your fridge and turn it into an amazing wrap, pizza, quesadilla or sandwich, and it’s also fun to plan ahead and brainstorm all the creative ways to use the flatbreads in a recipe. Plus they have a variety for almost every need: low cal, low carb, high fiber, high protein, and more. Looking to see what other recipes I’ve made using Flatouts? Check out my Savory Sausage Pumpkin Flatbreads, Chicken Caesar Wraps, Veggie Lover’s Flatbread, Black and Blue Steak Wraps, Easy Taco Cups, Spicy Southwest Chicken Wraps, Peaches and Cream Dessert Flats, Three Cheese Mushroom Flatbreads, Maple Bacon Breakfast Wraps, Chicken Saltimbocca Sandwiches, Buffalo Chicken Pinwheel Wraps, Spinach Artichoke Flatbreads, Greek Snack Flats, Mexi Burgers with Guacamole, Chinese Chicken Wrap, Chicken Pesto Flatbreads and Bacon Cheeseburger Wraps! If you make any of these recipes or create your own using Flatout flatbreads, make sure to share with us on social media using the hashtag #FlatoutFresh. I can’t wait to see what you make! Cook the bacon according to package directions until crisp. Set aside on paper towels to drain and then chop or crumble each slice into a separate pile. When the oven is pre-heated, place the flatbread directly onto the middle rack and bake for about 4 minutes until it stands firm when lifted. While the flatbread is cooking, combine the cream cheese, sour cream, mustard, garlic powder, salt, pepper and half of the crumbled bacon. Stir together until well combined. Remove the flatbread from the oven and spread the cream cheese mixture across the surface, leaving a bit of space around the edge for the crust. Sprinkle the cheddar cheese over the cream cheese layer and sprinkle half of the chopped tomatoes over the top. Return the flatbread to the middle rack of the oven and bake for another 5 minutes until the cheese is melted and the edges are lightly browned. Remove from the oven and top with the desired amount of shredded lettuce. Sprinkle the remaining crumbled bacon and chopped tomatoes over the top. Slice and serve immediately. BLT PIzza on a flatout is one of my most favorite things ever! I LOVE LOVE LOVE your idea for the base, I’ve only ever used Mayo before and something always seemed like it was missing! Going to try this stat!